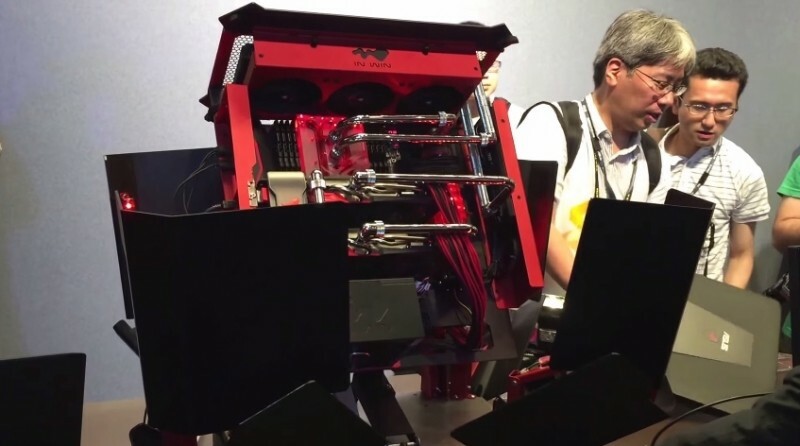 Asus announced a bevy of new products earlier today at Computex but one thing you might have missed is this transforming desktop PC chassis. Crafted with help from In Win, this unique convertible case from Asus’ ROG division takes the company’s popular “transformer” brand to a whole new level. As this clip highlights, a simple touch of a button is all that’s needed for the system to shed its side panels and tilt the motherboard tray at an angle. It’s not all about show, either, as the main components would be much easier to access in full “open” mode. Not much else is known about this system at this hour although Asus did say that the machine was to be mass produced. I imagine this one won’t be cheap. I was not surprised in the least that they could do this. When the article said they'd be mass producing it, I was far more interested. These things usually seem to be gimmicks, a toy created to show off and magnetize people towards their brand, but never intended to come to market. Even though they will produce these, that leaves more questions. There is a reason gimmicks like this don't come to market, they're simply a niche product for the elite few that would be able to afford it. And not all that could afford it would see the value of paying that which will most likely be a hefty premium. Then, I also have to say, damn that was a tad slow. Specifically where they were unextending the sides of the chassis, couldn't they have gone faster? Cool, but I'll never have one. I just leave my panel unscrewed? And seriously though, the transforming process takes up way too much space. Goes from the standard case foot print, maybe a little bigger, to the size of the entire desk it was formerly occupying... Seems like a great idea. Wow your really in a rush to do work inside your case, I leave my case screws in and take the extra 5 seconds to remove them before removing my side panel. But I see how Asus has a good idea, 7-8 seconds to manually get into my PC vs the 10 seconds it takes to "Transform" and make it easier to work on. Question, what about the 20 or so things I have plugged into my PC? All those wires are now just going to go along for the ride every time? Given at Lan parties you just have a couple things connected, but still, it's strain on the ports. It would be more practical to use the same hinge mechanism lambo's have on some of their doors on the case sidepanels. Or you know.. just get a case with a little clip on the side panel that takes all of.. 5 seconds to remove. Why would anyone need to get inside their case more than once every few months to clean out dust? Interesting, if dubious concept. Looks like Asus decided to marry the requirements of a closed chassis with an open test bench. More interested in the GTX 980 Ti Poseidon's sitting inside it. Thats about as useful as our president. Depending on the person, that is true with any product. Sure. Just unscrew everything. Then give your case a good push and watch everything fall apart! It's cheap too as you don't need screws. Dear techspot, could you get rid off all the comments from user "harrietk" above me? this user spamming all article with ads.